The regular players at my regular Dungeons & Dragons Encounters games include a mix of fourth-edition loyalists and folks indifferent to edition. Although I would happily run D&D next, I have bowed to the group and still run Encounters in 4E. That means converting the current Encounters season, Scourge of the Sword Coast, to 4E. The conversion creates a few challenges beyond just finding fourth edition stats for the monsters. Combats in D&D next take far less time than in fourth edition. Scourge of the Sword Coast lasts 12 encounters sessions. The season starts with two sessions introducing players to their home base of Daggerford and another session for the finale, leaving 9 weeks for the bulk of the adventure. Typical parties will visit four adventure sites, each with 20 or more numbered locations. The adventure budgets two sessions per site. In each site, most parties must win several battles to meet their objectives. In D&D next, a party can role-play, explore, and finish a few fights in a 2-hour session. In 4E, not a chance. At most, players can drop a sentry, and finish one battle. The surplus of material brings one benefit: Because Scourge of the Sword Coast includes far more material than I can play through, I can give the players plenty of choices, confident that their path leads to something in the text. In D&D next, every combat encounter taxes the party’s resources, while in fourth edition, only big encounters challenge a party. Unlike characters in D&D next, 4E characters typically regain all their hit points and most of their spells and powers after a fight. Some attrition comes as they slowly lose healing surges, but 4E characters rarely run out of healing surges. Characters’ encounter powers make them more powerful during the first rounds of a fight. Characters can focus encounter powers on outnumbered enemies, leaving few survivors to return attacks. After the encounter, characters regain all that firepower without meaningful losses. They might even gain action points and grow stronger. No 4E player will waste a daily on a small encounter, so even that small element of attrition never factors in. In 4E, small fights just add flavor without challenge. Between battles, fourth-edition characters regain most of their resources. This design aims to encourage players to adventure on instead of resting after a five-minute work day. While 4E removed some built-in reasons for players to quit early, the best reasons for pressing on still come from the adventure’s narrative, or at least from wandering monsters. Smaller combat encounters dominate Scourge of the Sword Coast. In the adventure sites, D&D next players must pick and choose their battles, perhaps avoiding some. The sites have organized defenders, which means if the characters retreat, they face pursuit and give the monsters a chance to reinforce. In D&D next, this adventure design works. For fourth edition, I’ve focused each site on a couple of big fights. The organized defenders make this change reasonable. Once a fight begins, the monsters can rally guards from other locations. One battle featured the party pursueing monsters through a network of cellars, struggling to prevent the fleeing goblinoids from joining more waves of reinforcements. Fourth-edition D&D makes preparing monsters and encounters easy. This conversion process highlight one of my favorite aspects of fourth edition. The game makes adjusting monster and encounter difficulty simple. The Adventure Tools’ Monster Builder allows me to search a list of all the monsters published for the game. I can find suitable replacements for creatures in the adventure. The original monster level hardly matters, because the tool lets me add or subtract levels. The tool automatically adjust hit points, defenses, damage and so on. I favor fourth edition’s approach of building encounters with a mix of monsters in different roles. So even if Scourge of the Sword Coast only lists vanilla goblins at a location, I pick a variety of goblins for my encounter. As much as I like the scalability of 4e monsters, the demands of organized play have forced authors to rely on scaling more than I like. Later Living Forgotten Realms adventures typically scale the same monsters across an entire tier. I once ran an adventure that pitted my table’s first-level party against a group of trolls, including minions. Somehow, seeing new characters one-shotting hulking trolls offended my D&D sensibilities. On the high end, I ran a battle interactive that scaled kobolds to eighteenth level for my high-paragon table. Flavor aside, the mathematical adjustments utterly failed to make these kobolds into anything more than an opportunity for players to demonstrate their powers. Even the most elite kobolds in the entire world cannot hope to challenge 18th-level heroes. I’m not criticizing the volunteer authors of these adventures. The job of creating adventures that scale across 10 or 20 levels poses enough challenges without requiring different types of monsters at different levels. Fourth edition also makes balanced encounters easy. Include one monster per character. Optionally, add as many minions as you have figures—minions never swing the tide of battle. When running the organized defenses of Scourge, I often start with a few defenders and then add extras as the battle develops. Even against waves of attacks, 4E characters prove resilient enough to escape defeat. 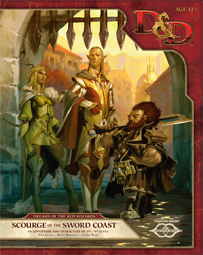 This entry was posted in Advice, D&D fifth edition, D&D fourth edition and tagged conversion, D&D Encounters, power, Scourge of the Sword Coast. Bookmark the permalink.